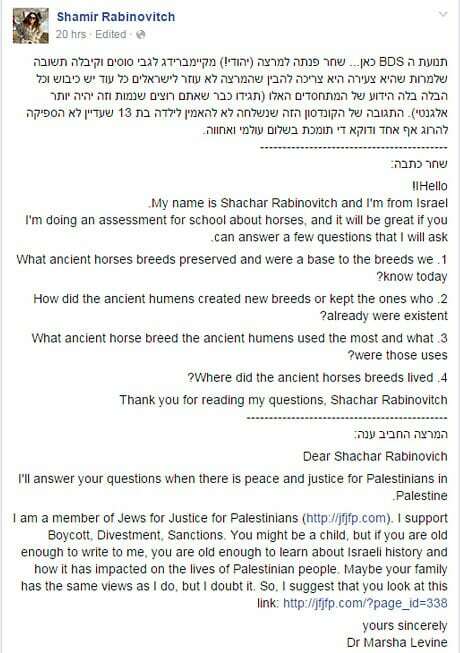 A 13 year-old Israeli girl had an assignment on horses. She had the gumption to locate a lecturer at Cambridge, Marsha Levine, who is apparently an expert on the domestication and history of horses (yep, that’s apparently a thing). And the courage to contact her in broken English. What she received in response was horseshit. What kind of person would act so callously to a 13-year-old child? Perhaps the kind who can support those who have no problem shooting or killing one, or at least turn a blind eye to them. BDSHoles pride themselves on being “humanitarians” and really good human beings. They are not, and Levine’s conduct here is an example of how they are rotten to the core. I should note Levine is now a photographer. I am telling you this just in case you want to, you know, boycott her. Update: Explaining her despicable actions, Levine shows no remorse, and in fact makes things worse by comparing us to Nazis. 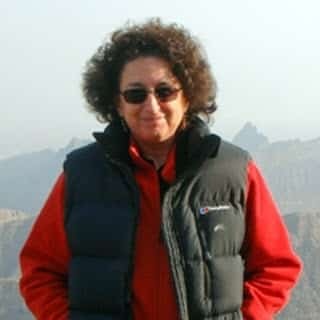 Contacted by the JC on Tuesday, the American former academic defended her response. She said: “I didn’t ask her to email me. I don’t know how she got my email address. I can do whatever I want. I didn’t invite her to email me. If she wanted to read anything I had written she could find it on the internet. Dr Levine said she wanted Miss Rabinovitch to stand up to violence when she grows up. “The violence against Palestinians never stops”, the Cambridge-based former academic said. “The people who live in Gaza cannot get education, health, water. What does it say about Jews that they support that? Jews have turned themselves into monsters. “I want this girl not to worry about horses. I don’t need people emailing me. I’m not an academic anymore. My research was all in the past. I’m doing other things now. I don’t see any obligation to further her ego or make her feel better about herself. I don’t think it’s about her – I think it’s about her parents. “I gave her useful information which might help her for the rest of her life. I have to stand up for what I believe in. “Benjamin Netanyahu wants ethnic cleansing. The Jews have become the Nazis. Jews are behaving just like the people who treated them. It’s not all Israelis or all Jews. Talk about hoof in mouth disease. Update: The story made it to the Israeli news, where the reporter asked Levine if she would like to apologize. See from 3:12 for her response.